Pesticides have been used for thousands of years, but their use was greatly expanded between 1940 and 1960. Rachel Carson highlighted the dangers of the excessive use of DDT, which was highly promoted by chemical companies. Integrated pest management had been around for decades but by the 1970s, blanket spraying of DDT was banned and IPM was becoming common practice. Just like farmers, all gardeners should have some knowledge of integrated pest management. In recent years, the use of IPM has been abandoned by some farmers in favour of the use of neonicotinoids, a class of pesticides that is proving to be every bit as awful to wildlife as DDT was. Integrated pest management involves a combination of strategies to reduce the amount of pesticide used and to target pesticides more carefully at the organisms of concern. Below are several suggestions for achieving a 100% reduction in the use of pesticides. The suggestions have been modified specifically for wildlife gardening. If you are growing crops, you may want to contact your local agricultural extension office for more advice. A small population of pests on your plants will not do noticeable damage to your plants. Usually, they will do more good than harm because they will feed predators that will in turn keep a variety of pests under control. Do not use pesticide unless you are sure that the pests are becoming seriously deleterious to the health of the plant. Continually monitor your plants for pests throughout the growing season and identify the ones that you see. All gardeners should learn something about insects in their garden and there a plenty of pictures on this site to help you get a start. I recommend buying Garden Insects of North America by Whitney Cranshaw as a good general guide. Select plants that are adapted to the conditions in your garden. You need to consider soil type, rainfall, temperature and available light in making your decisions. Plants that are stressed will be more likely to succumb to plant or fungal pathogens and insect pests. Remove any parts of a plant that are diseased. Most insect pests can be left on plants to feed predators. Unfortunately, wildlife gardeners still need to keep their eyes open for exotic insects that have no serious predators. These animals end up being a "top herbivore" and herbivorous insects are not usually meant to be at the top of the food chain. The first line of defence is to change cultural practices and to use mechanical methods of control. Trimming viburnums in the fall instead of the spring and burning the shoots to kill European viburnum beetles. Planting annuals in different locations to prevent disease recurrence and pest build-ups. Watering flowers in the morning to discourage fungal pathogens. Cleaning up leaf litter around Birch trees to prevent the pupae overwintering. Not adding diseased plants to your compost pile. Hand picking Japanese beetles and crushing them. Putting a barrier around the trunk of the tree with some sticky stuff to stop crawling insects. Hand weeding early in the season or using gas torches on your driveway. Garden hose can be used to trap earwigs. 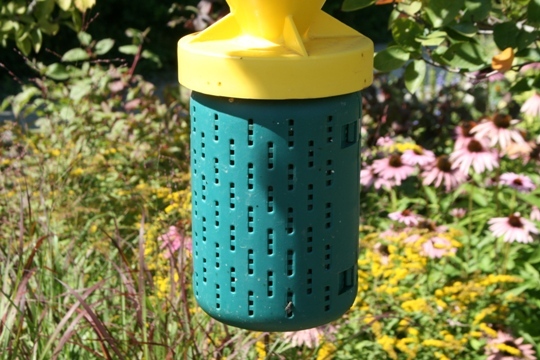 This is a typical trap used to capture beetles in a garden. Some plants can be used to divert pests away from your valuable plants. Do not use traps for Japanese beetles as tney just attract more of them! The only way to keep Japanese beetles from becoming overwhelming is to kill them on sight manually. A trap is not effective for these particular beetles. Using beneficial insects to control pest populations is generally much easier and cheaper than using pesticides. Many of these insects require a nectar source as part of their life-cycle. See the webpage on promoting beneficial wasps. In a wildlife garden, the beneficial insects and spiders should provide more than enough control to keep the pest populations low. Only in the first year of a garden might you experience problems, because everything is ecologically still out of balance. Some beneficial organisms are commercially available. These include ladybugs, predatory mites, bacteria and nematodes. Providing bird seed is a good way to attract birds. The birds will diversify their food sources by eating pests in your garden and you get to enjoy both the plants and the birds. To attract ladybugs, the aphids must be there first. The ladybugs will arrive and lay eggs on the same plant. The larvae that hatch have a voracious appetite and the aphids do not last long. Unfortunately, this particular species, Harmonia axyridis, is invasive and eats more than just aphids. It arrived in Ontario in 1994 and is now the most common ladybug that I see. Avoid using a broad spectrum pesticide; find something that targets a specific organism. Only apply the pesticide at a time when it is going to be effective. Use only the minimum amount of pesticide required. Use green alternatives such as insecticidal soaps, but bear in mind that calling them green does not make them green. Choose insecticides with low persistence. Choose insecticides that represent the lowest level of threat to humans and pets. Using IPM techniques involves a fair amount of judgement. Evaluation of the results is necessary to ensure greatest amount of success with the least amount of labour and inputs.